Ireland is no doubt a beautiful country with many great tourist attractions which are very well worth visiting. I have been living here for just half a year, so there are still many nice places that I have never been to – all of them await my exploration. Semester 2 just starts so l got a bit more time to do something I like, travelling is, of course, one of my favourite hobbies, so in this month, together with my friend, I’ve decided to make a tour in some gorgeous places. First stop: Cliffs of Moher. 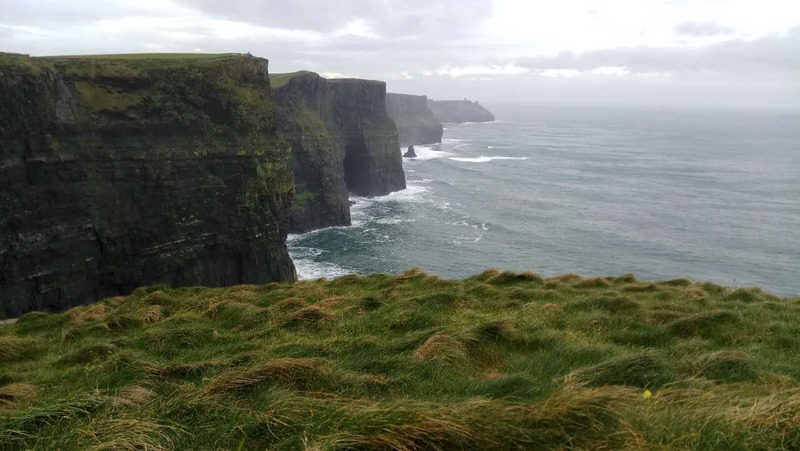 Cliffs of Moher was my first destination because many of my friends recommended it to me saying that the landscape there is so awesome. So I couldn’t help but start my first journey there. When I was on my way to the cliffs of Moher, I was admiring the landscape along the way from the bus. It was beautiful especially when it nearly came to the cliffs, views got better, bus running around rolling hills, on the one side of way, it was green hills with different vegetation, sometimes I could see even several languid cattle and sheep grazing on the hill, on the other side, it’s jaw-dropping cliffs facing the Atlantic Ocean. In some part of the way, the cliff was very high, the bus was just running alongside, so it might be some bit spine-chilling, but the view was actually nice. Once I got off the bus, I was immediately attracted by all great beauty there, I could even sense the smell of the ocean. Air was very fresh, the sky was so blue and clear, rocks were weird, everywhere was greeneries. But only one thing that was not very good was that it was greeneries. 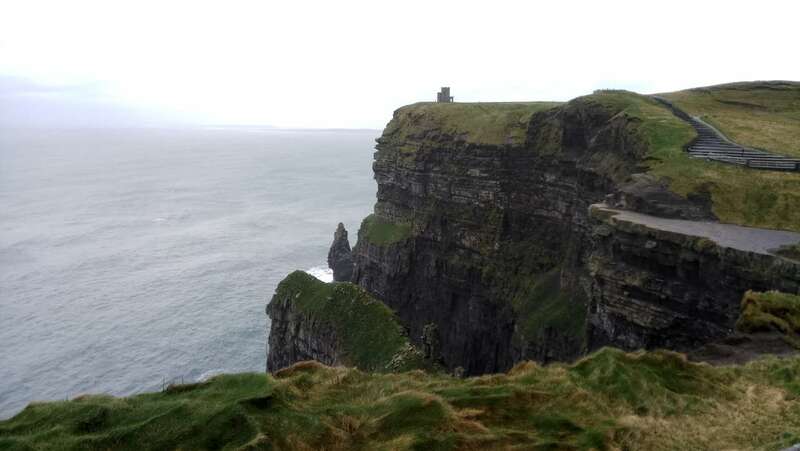 But the only one thing that wasn’t very good was the cloudy day, also it rained a bit, the wind there was so strong that I have never seen before, it was even very hard for me to walk against it when I reached O’Brien’s Tower, the highest point of Cliff of Moher. 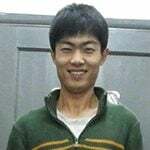 Then I walked for a while with my friend along the trail in coastal areas, appreciating the scenery from different perspectives. We also took many photos there, it was so picturesque, especially for some rocks in the ocean, though it looked weird, together with cliffs, howling ocean, blue sky and greeneries on the hill, it formed a perfect picture which was enchanting. 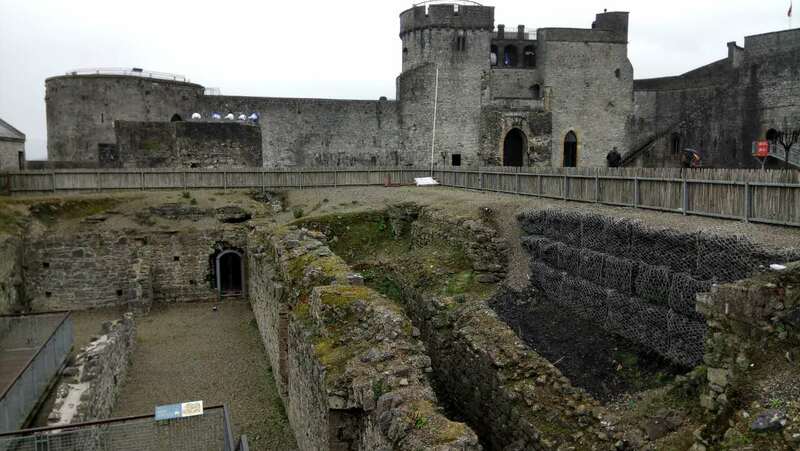 After finishing visiting the Cliffs of Moher, we went to Limerick. However, by the time we got there, it’s totally dark, so we had to visit it the next day. Limerick, though I felt it’s a small city, was really a nice one. There are many historical ruins and buildings there. Frankly speaking, I like history so Limerick is a good place for me. During the daytime, we have visited many places, such as different kinds of churches, museums, and historic ruins and buildings, but one thing I liked the most was to visit King John Castle, which was built on the order of King John in 1200. One of the best preserved Norman Castles in Europe, the wall, towers and fortification remain today. Also, the remains of a Viking settlement were uncovered during archaeological excavations at the site. Castle looked solid and magnificent on façade. When I walked inside into the castle, there are many historical relics on the show, also many replicas and models which reflect and simulate the castle lives from hundreds of years ago. It was really a lesson for me, which gave me insights and knowledge about castle history in Ireland. When I then climbed up the top of the Castle. The view was so excellent there. 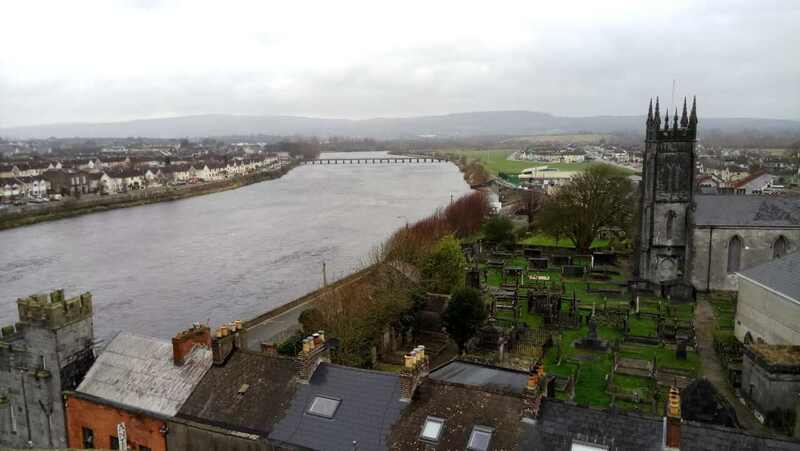 I could almost see overall Limerick city from the top of Castle, including all kind of buildings, running river below and bustle and hustle of streets, that’s fabulous.